After leaving the Tobago Cays we sailed to Chatham Bay on the west coast of Union Island. We snorkeled the rocky point at the north entrance to the bay, drifting with the current along deep vertical walls covered with coral and sponges. Large schools of chromis and other small fish were herded towards the rocks by predator fish from below and attacked by boobies and pelicans nesting on the cliffs above. The bay is large enough for cruising boats to anchor with privacy, and a mile-long beach adds to the sense of tranquility. 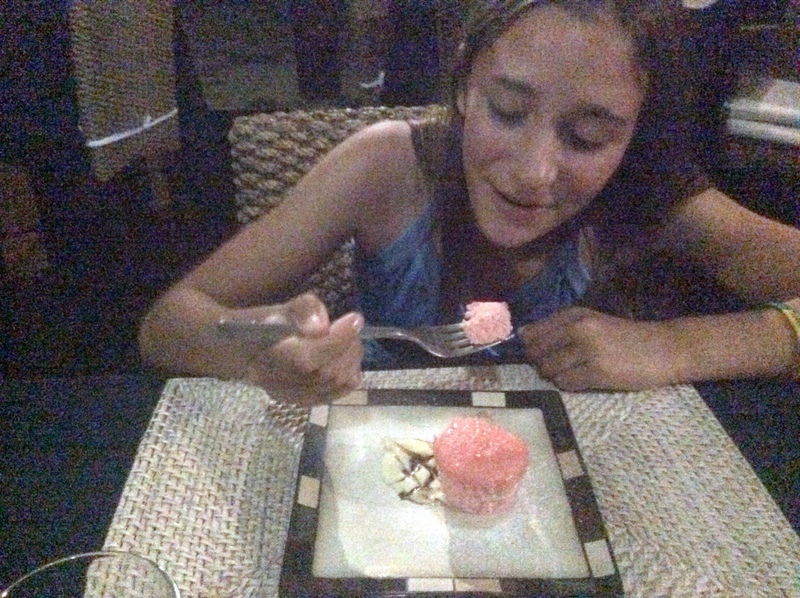 We ate dinner at an open-air restaurant on the beach. The food was tasty, but for the adults the best part of the evening was the sunset, a green flash, and a long, peaceful twilight. For Megan the highlight was the cake. Near Isle de Ronde, a small island with black pumice and ash. After a day dominated by customs and immigration, clearing out of St. Vincent and the Grenadines on Union Island and clearing into Grenada on Carriacou, we spent the night in Tyrrel Bay. 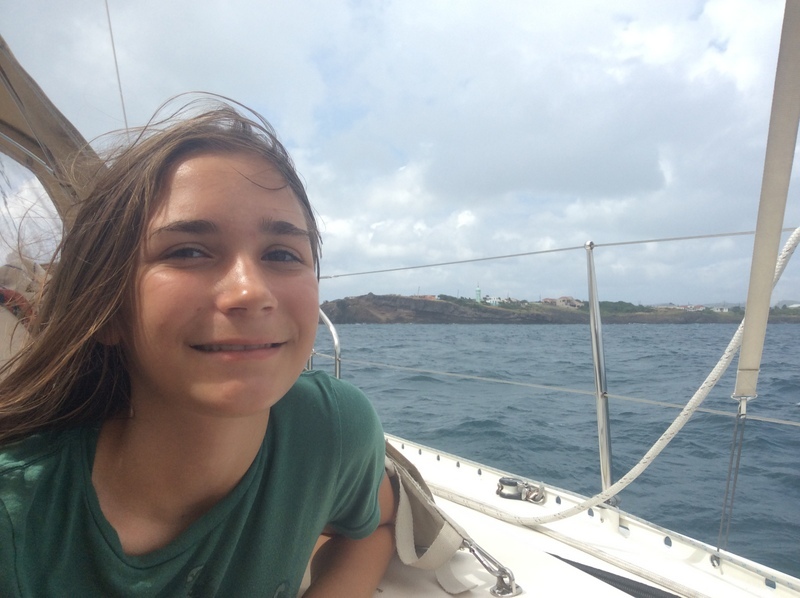 The next morning brought perfect sailing conditions for the 42-mile sail to Grenada. 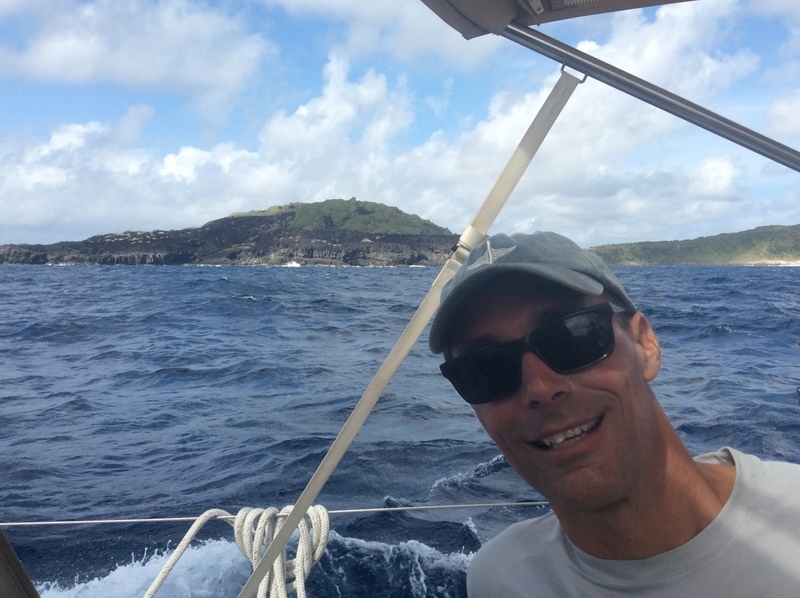 With 15-18 knots on the beam we reached past Kick ’em Jenny Rock, Isle de Ronde, and down the windward coast of Grenada, making 7.5 knots with slight heel and an easy motion. Megan organized word games in the cockpit, Owen read an illustrated novel, and Colin got a big strike on the trolling rod, causing 20 seconds of excitement before the leader broke. Mostly we enjoyed speculating about the islands’ geology and the apparent evidence of volcanic eruptions, ash and lava flows, and erosion. We will try to learn more about island geology during our time on Grenada. Bearing off down the south coast of Grenada we ran wing-and-wing. With the jib on the pole and the main held tight by the preventer, we surfed comfortably and chased down a catamaran with a mile-and-a-half lead. Then we jibed and bore up into Prickly Bay, Megan posing near the entrance for another lighthouse picture. 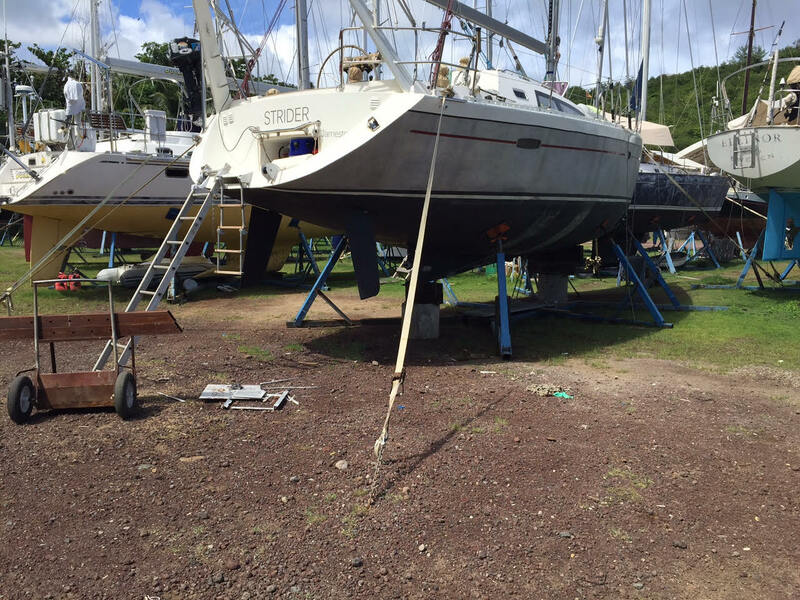 We anchored under small cliffs topped with well-kept homes and flower gardens, surrounded by live-aboard cruising boats, many of whom call Grenada their home. We said good-bye to Sheila the next morning, and now we are excited to get to know Grenada and its people.